Classic Cameras shows over 500 close-up, high-resolution photos, vintage ads, reviews, articles, and original brochures of over 90 of the most important classic cameras from 1905 to 1985.An internet connection is required.Cameras include the Argus A, which made 35mm film a success; the Contax S, the first SLR with a pentaprism; the Topcon RE Super, the first SLR with through-the-lens metering; and many other firsts. 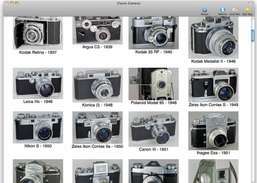 Also included are favorites: Leica M3, Nikon F, Contarex Bullseye, Olympus Pen and Pen F, Leicaflex, Pentax Spotmatic, Olympus OM-1, Minolta Maxxum 7000, and many more.The app automatically receives new material for existing cameras, as well as camera additions. In June 2011, for example, the following cameras were added: Rolleiflex 3.5 Automat MX, Kodak Pocket Instamatic 20, Kodak Duaflex IV, a bunch of Brownies and Hawkeyes, Canon 110ED, Canonet, Konica Auto S, Kodak Colorburst 200, Olympus 35RC, and Minolta Hi-Matic/Ansco Autoset.In July, I've started to update the material almost every day... more of a daily Classic Camera newspaper than a mere app!And I haven't stopped. These cameras were added in August: Minox 35, Kodak Tourist, Clarus MS-35, Kodak Pony 135, Bolsey Model B, Braun Paxette Electromatic, Olympus XA, Perfex Fifty Five, Univex Mercury, Voigtlander Vito B, and Argus C-4.Each of the 90+ cameras has its own gallery with full-screen photos and other material (ads, reviews, articles, and brochures). You can view the items in a grid (with captions) or extra-large. You can order prints through this app.All of the photos were taken personally by the author of this app, Marc Rochkind, with a 90mm macro lens and a full-frame Nikon D700, using studio lighting. Ads, reviews, articles, and brochures (with a few exceptions) were scanned by him from his exhaustive collection of photography magazines and other materials. 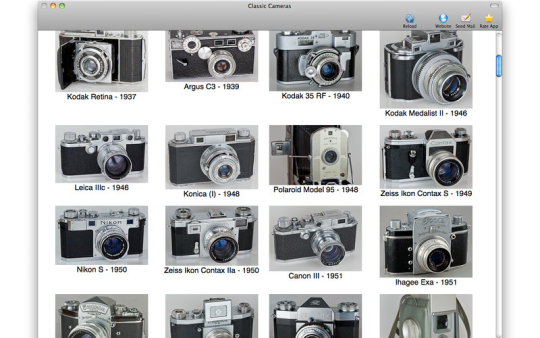 The cameras are all in his personal collection; the photos are of these actual cameras.If you love photography, this app give you a rare opportunity to go back in time and enjoy seeing these cameras as never before. The collection of extensive source material is also unusual, perhaps unique.